Plus, Wright Thompson has written a typically excellent piece for ESPN on Geno Auriemma. 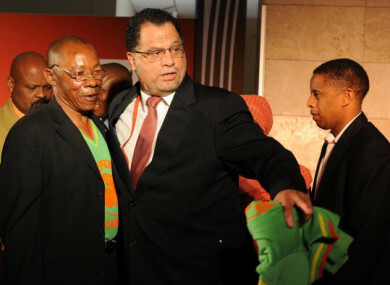 Zaire former player Ndaye Mulamba with OC CEO Danny Jordaan pictured at an event prior to the 2010 World Cup. 1. “As Britain staggers like a belligerent drunk towards Brexit, let’s try to see things from a future historian’s perspective. “Why, she or he will wonder, did one of world’s richest, most successful countries opt for political chaos? What turned a previously stable, mature, pragmatic and tolerant-seeming democracy towards xenophobia, unreason and economic self-harm? “Most of the scholar’s attention will no doubt focus on Britain’s reckless and dishonest politicians. Research into right wing media tycoons and their hate-promoting newspapers is sure to pay dividends, too. The alienation and post-imperial yearning behind Brexit have their parallels within football, argues David Winner in The Blizzard. Manchester City’s title stroll should not distract from the strength of competition, writes Jonathan Wilson. Wright Thompson has written a typically excellent piece for ESPN on Geno Auriemma, head coach of the University of Connecticut Huskies women’s basketball team. Walter Tull spent his whole life breaking down walls – it’s time he was properly acknowledged and we learn from his tale, says The Independent’s Jonathan Liew. 5. “Poor and wheelchair-bound, Ndaye Mulamba has just been told he faces eviction from his rented home in Kinshasa, 44 years after he was ejected from the World Cup for kicking a referee up the backside. The Guardian’s Paul Doyle explains why Ndaye Mulamba is living like a pauper 44 years after the Zaire red-card farce. Email “Whatever happened to the Zaire player who kicked a ref up the backside and this week's best sportswriting ”. Feedback on “Whatever happened to the Zaire player who kicked a ref up the backside and this week's best sportswriting ”.